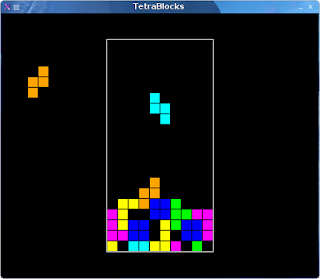 After having dumped the initial TetraBlocks code, the new version is coming along quite well and has proceeded especially well for the last few days. The few things left involve the deletion of lines and score keeping and putting a cap on the height. I've decided to do away with the menu and highscores system since it added for excess complexity. Here is a screenshot of the latest developments.